It's hard to believe we spent our last night in Israel! We began our morning by going on a beautiful hike with our friends from Merchavim. We hiked up Nachal David in Ein Gedi and had the opportunity to swim under a waterfall. Since we are now expert hikers, this hike was very easy for us! We closed our hike with a beautiful tekes (ceremony) in which we thanked our Israeli hosts in both Hebrew and English. After saying our goodbyes, we headed straight to the Dead Sea. We covered ourselves in mud and walked into crystal clear water. Many of us floated and experienced the strength of pure salt water. We hope to return home with glistening skin! Although we are so excited to reunite with our families, we are sad to leave behind the rich experience we have had in Israel. Another packed day of fun in the sun! 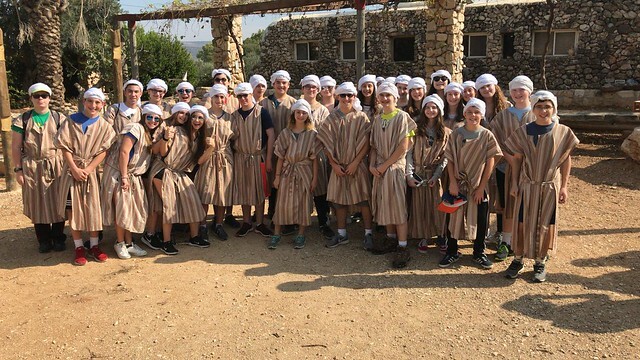 We were glad our Merchavim friends were able to join us for a day in Ein Gedi. 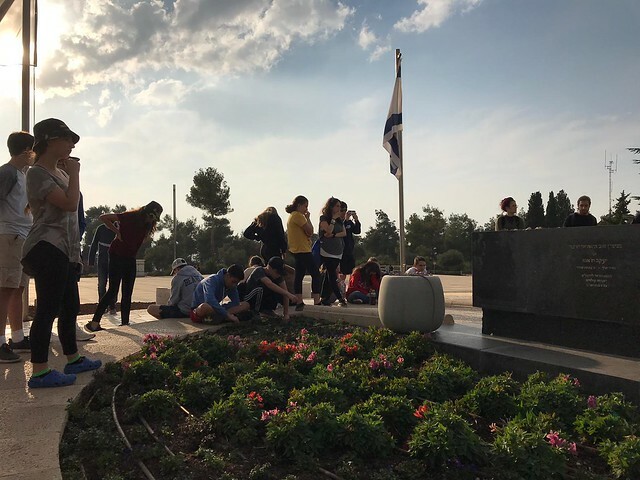 The living bridge with the Merchavim community brings with it an additional layer of awareness to the complicated situation on the southern borders of Israel. It is a reminder to the interesting fact, which, I think reflects the duality Israelis live in, that all the Kibbutzim and Moshavim (settlements) along that border are attracting many young families who build their homes there. 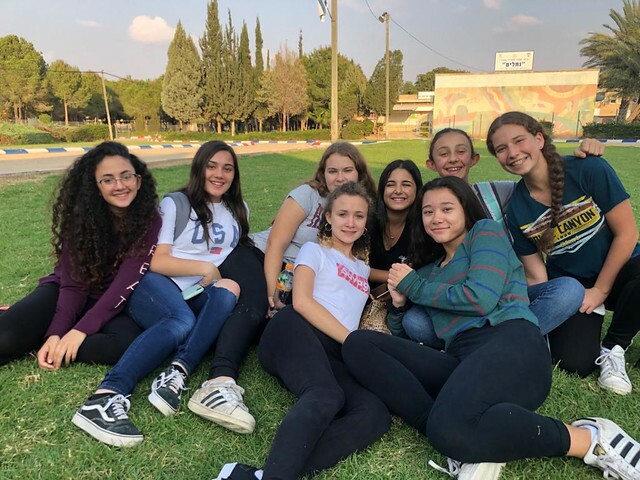 Tomorrow begins with a visit to Yad Va’shem, followed by lunch in a nearby neighborhood Beit Ha’Kerem, a visit to Har Herzel Museum, then the much anticipated visit to Machne Yehuda (market) and final dinner at Black Burger - a great restaurant even for vegetarians! I have no doubt that many of you are following the news from Israel regarding renewed attacks from Gaza. Currently, our Naale students are in Jerusalem and not near the parts of the country that are experiencing these issues. Tomorrow they will be driving down to Ein Gedi and The Dead Sea. I know that all of you join us in praying that our friends in Merchavim remain safe and that there is a return to calm very soon. In our effort to make sure that our students still have the opportunity to meet with their friends from Merchavim, we are planning for them to join us tomorrow at Ein Gedi for a fun hike and conclusion of the Mifgash. Should you have any questions, please don’t hesitate to be in touch and we will continue to keep you posted if any other plans need to change in the coming days. Shabbat in Israel was beautiful. After an action-packed trip, it was very nice to have time to rest and be present with one another. After a musical Shabbat service and dinner, we broke into teams for some healthy competition. On Saturday, we got to choose between two different synagogues in Jerusalem. Not only did we experience Israeli synagogues, but we also experienced Kiddush. In addition to all of the delicious food, we got to eat Krembo! We spent the rest of the day doing lots of group bonding and feel really fortunate that we are all growing together and making new friends. 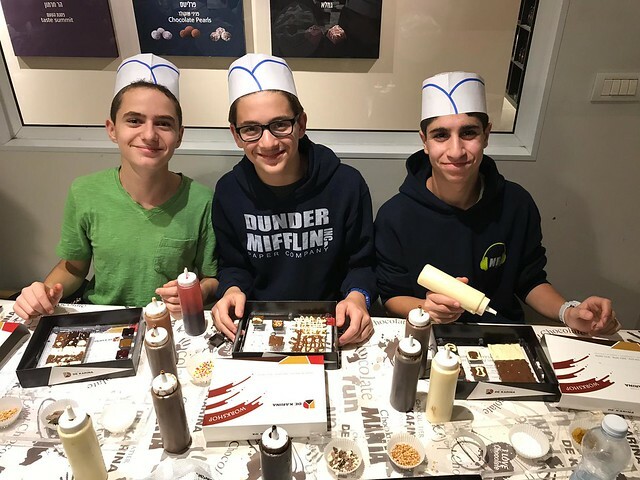 One of the highlights included "Cafe Dilemma" in which our staff members hosted round table discussions on topics such as confidence, traveling to different Jewish communities around the world, moving to Israel, and creating a more open and welcoming Jewish community. After concluding with Havdalah, we spent the night exploring Ben Yehudah street. In addition to eating our way through Ben Yehudah, many of us practiced our negotiating skills while buying souvenirs. Although we can't wait to see our families again soon, we are so grateful that we have a grade full of thoughtful, kind, and energetic kids! Today we spent the day with the kids from Merchavim. After packing our bags and going to breakfast, we boarded the bus for Merchavim. When we got off the bus, we were greated by our hosts. We were then split into two groups, the first going to the “sport building” and the second to a classroom. In the “sport building” we played volleyball with mixed teams (Israelis and Americans were on the same teams). 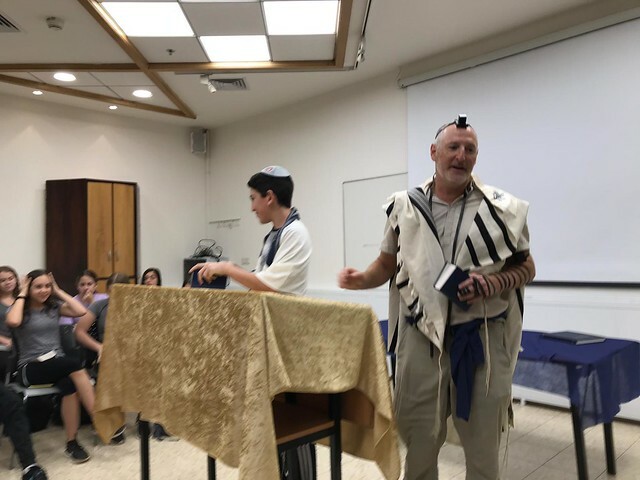 In the second group, we learned with the host students about four Jewish texts about Jewish responsibilities and building a community. After we learned the texts, the Merchavim hosts took us in a tour of the very large campus. For lunch, we had a falafel bar with different types of salads, hummus, tachina and “chips,” (Israeli for French Fries) following lunch, the groups switched. When the school day was over, we went home with the host students on the bus. we all met our host families and ate dinner with them. Overall, it was very fun to meet the Israelis and learn about Israeli culture. If you have been to Israel on Friday you know there’s a special feeling in the air: everything slows down, there’s a sweet smell of Challa and cakes in the air, people sitting in cafés enjoying their day off (Kids are at school, so it really is a day off!) the streets empty in the afternoon, many shops close, in some neighborhoods a siren goes off to indicate candle lighting time is very soon. In many ways it’s a reminder that it’s the Jewish State, with a Jewish time line, Jewish calendar etc. It’s a rewarding feeling for Naale after a packed week. 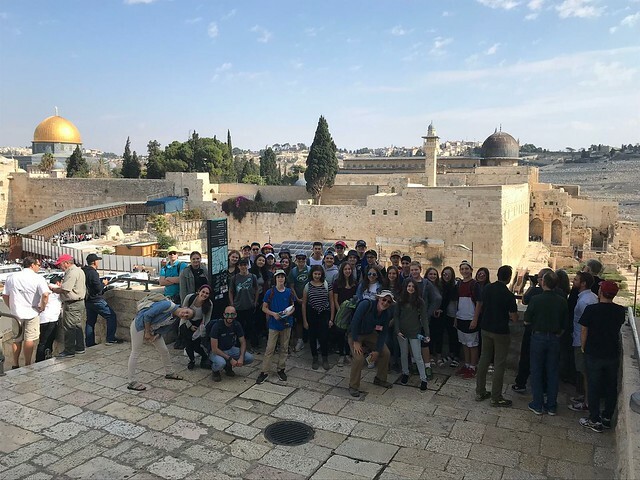 This morning the group visited the Jewish quarter of the old city, the Kotel, the Davidson museum, followed by lunch at the first station http://firststation.co.il/en/ and time to prepare for Shabbat. They will daven (pray) Kabalat Shabbat at the Kotel, another special experience. I hope you had (or will have) a good day of conferences. One of our preparation activity before Naale left, was focused on the difference and similarities between Israeli teens and American. Back in the mid 90’s when a Mifgash (encounter) was beginning to catch center stage in Israel education we spoke a lot about the ‘cultural Iceberg’ the little commonality above surface doesn’t reflect on the depth and width of what connects us. Today, together with Merchavim students and Naale experienced first steps exploring and cultural iceberg. Today student enjoyed their first shared experiences of many to come. Digging together shoulder to shoulder, sharing little moments of joy, surprise and frustration digging out our shared history is where personal bonds are created and where the surface of the iceberg includes more. After meeting our buddies from Merchavim, we traveled to an archeological dig. The Jewish people from the time of Chanukah built their houses out of stone quarries from the ground, and used that remaining space to run their businesses. When the land was taken over, the people threw everything from dishes to jewelry down into these rooms. Now, thousands of years later, we had the opportunity to dig in some of these caves, searching from anything from charcoal to pottery shards. Some of the coolest things we found are a large pottery shard and a goat jaw bone. After digging, we went ‘spelunking’, or exploring a cave that was already dug up. We dropped through holes in the rock and shimmied through tight spaces. The tour ended with a discussion of what the archaeologists had already found including tablets in Ancient Greek and gold earrings shaped like angels. Not everyone enjoys being dirty and dusty, yet it was an enlightening experience and an inside look into our history. After that, we went to our hosts homes and met their families. We had dinner with them and experienced Israeli life in their homes. Some of the groups met up later to hang out as Israeli teenagers living life. Since they do not have school tomorrow we could do more exciting things. It was a good experience to be able to interact with teenagers from a different part of the world. Every Naale group has its own character, inside jokes, bus spirit, stories about Madrichim etc. But all groups have at least one thing in common (aside of loving the donkey rides) they all go through the same ‘group lifeline’ order: first few days all are happy, cooperative, supportive, excited, patient towards each other, forgiving and more. Around day 4/5 they begin to lose the positive vibe for what we call the group crisis. Suddenly Naale feels way to long, the food isn’t exactly what they wanted, some friends get on their nerves, the staff don’t get them and other negative feelings. This lasts for usually 24-48 hours. By Friday afternoon, when all are ready for Shabbat the atmosphere changes to a relaxed enthusiasm, positive energy is back with a glimpse of realization that Naale is almost over, but it doesn’t affect the energy. This phase usually lasts until Monday night when the suitcase needs to be packed…All this to say that in the next few days don’t be alarmed if your Naale’nik calls to complain, to cry, to share frustrations. Please listen to them, let them be upset, don’t try to solve the problem. If you are not sure what is going on, call or email me. 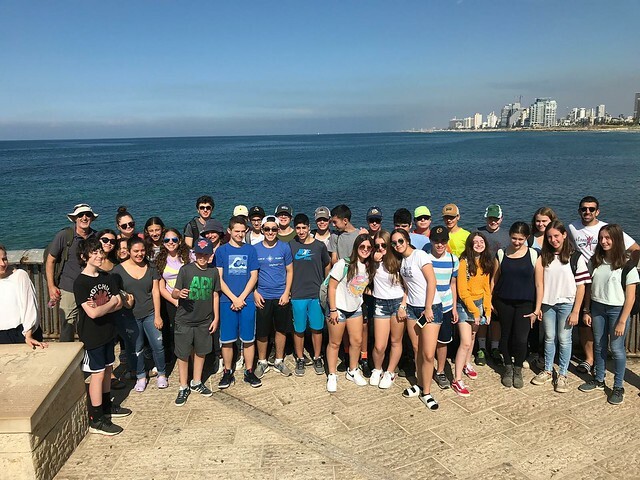 Tomorrow Naale are headed to Tel Aviv-Yafo, to tour the old city of Yafo, learn the history of Tel Aviv, visit the Dialogue in The Dark museum, meet family/friends at the Holon mall and finally drive up to Jerusalem for their first night at the Agron youth hostel. We are very excited to go to sleep after an action-packed first day! Following breakfast, we headed straight to Kfar Kedem, a village that tries to replicate life in the times of the Mishna, for donkey riding. After learning donkey language and going on a walk with our donkeys, we received our donkey driving licenses. Tomorrow is another day up north, this time in the Golan Heights, with a short hike of the Jilabun stream, a visit to Mt Bental to understand the geopolitics of our northern border (https://www.touristisrael.com/mount-bental/5821/) followed by a chocolate workshop (http://de-karina.co.il/en/), dinner in Tveria and the famous, all time GOA favorite, disco boat. Naale 2018 landed safely at Ben Gurion airport. After some time to refresh, eat breakfast and a 2 hour bus ride to the north, Naale will begin their first day with a GOA all-time favorite activity – the donkey ride at Kedem Village. After the ride and lunch they will hike Mt. Arbel, one of the most magnificent hikes Northern Israel has to offer. It’s a long packed day that helps with jetlag!